This post was written by my brother Nigel, and he asked me to post it for him. 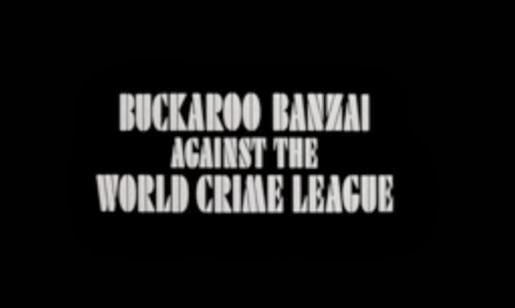 In the eighties, the cult sci-fi movie Buckaroo Banzai: Across the Eighth Dimension ended with tantalizing words that captured the imagination of fans when it said to stay tuned for "Buckaroo Banzai Against the World Crime League." Who is the World Crime League? What adventures would Buckaroo get into next? Unfortunately, due to deliberate mismanagement of the license, the sequel never materialized. In the nineties, Ernest Cline (who later wrote the acclaimed sci-fi novel Ready Player One), created his own script for the proposed sequel. It's available online, and is hugely popular among Banzai fans. I finally got a chance to read the Buckaroo Bonzai script, and found it a potent blend of craziness, action, and fun. The story involves Buckaroo's discovery that he can use his Oscillation Overthruster to teleport from one place on Earth to another. His technology is stolen by his mortal enemy, Hanoi Xan and his World Crime League. Xan has used the Overthruster and a network of secret brain implants to control world leaders. When Xan threatens to take over the world, Buckaroo enlists the help of his Blue Blaze Irregulars around the world to battle Xan and his evil army. The script does a great job of bringing back all the things we know and love about Banzai (the Jet Car, the Lectroids, the Hong Kong Cavaliers, and even Rawhide) while introducing new elements like Xan's elite army of Bravos who must cut off their own ear to prove their loyalty. The characters are spot-on. Buckaroo delivers his trademark wit and wisdom, Perfect Tommy is perfectly vain, and I could easily imagine the whole crew back on the screen. WCL doesn't achieve a level of insanity as deep as the original movie, even though it does get pretty crazy. What WCL does give is a deeper and bigger view of the Banzai mythos. We meet dozens of new Banzai agents, a secret government agency charged with spying on Banzai, a full rock concert of the Hong Kong Cavaliers, and an oceanic version of World Watch One called the Leviathan. The real triumph is Hanoi Xan, an Asian criminal mastermind responsible for killing Buckaroo's parents and Peggy, Buckaroo's true love. Ultimately, the script is unfilmable and knows it, which allows it to go big and never stop. The script delivers a lot of great action set-pieces like an attack on the president at a college graduation, a journey through the eighth dimension in the World Watch One bus, and a climactic air, land, and sea battle at Xan's Burmese fortress. There are cameos to other like-minded movies like Big Trouble in Little China, and even Jay and Silent Bob. It's also a love letter to fans, literally incorporating some real online fans as members of the Blue Blaze Irregulars. Since WCL's release, the original screenwriter of Banzai has been co-writing a comic book series continuing the adventures of Buckaroo Banzai. It's way more imaginative and wilder than WCL (the first series involved John Whorfen using fields of potatoes to move the Earth out of orbit), but I can see why this screenplay took fans by storm. World Crime League feels like a satisfying continuation of the story, and lets us all dream of seeing Banzai back on the big screen. What do you think of the Buckaroo Bonzai sacript. Would you like to see a sequel? I'm sorry, I have to admit - I never liked the first movie. Just didn't resonate with me. I know better than to knock that movie on this blog. Surprisingly this hasn't been slated for a reboot yet has it? It would have to be rebooted. The casting in the original was great, it would be hard to redo it properly. Maybe an animated version based on the comics? Weird wild, and good, stuff, that Buckaroo Banzai. The only thing stopping a remake or continuation is finding a way to make it something more than another cult-sized hit. i wish they could do a sequel, i would love to be part of that experience... but not a reboot.